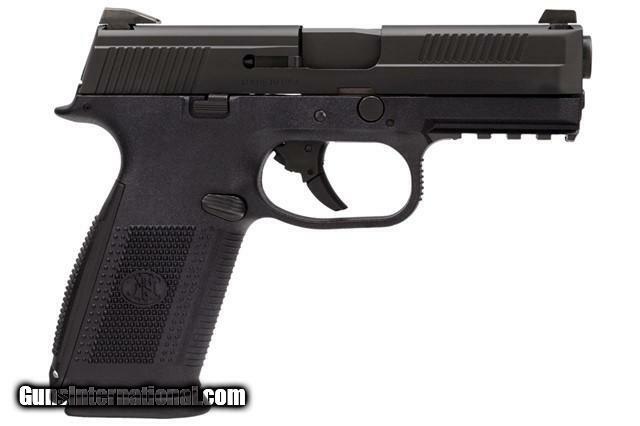 The FNS-9 offers the simplicity of double-action striker-fired operation with the option of a manual safety. The slide stop lever and magazine release are all fully ambidextrous for ease of operation wtih either hand from any firing position. Both the slide and barrel are stainless steel and the checkered polymer frame has two interchangeable backstraps with lanyard eyelets. A MIL-STD 1913 mounting rail on the underside accepts tactical lights and lasers. This firearm has no manual safety. FREE 60 DAY LAYAWAY! 25% DOWN AT END AND THE REMAINING WITHIN OR ON THE 60th DAY. 15.00 SHIPPING TO ANYWHERE IN THE LOWER 48 STATES. IT IS YOUR RESPONSIBILITY TO KNOW IF THIS FIREARM IS LEGAL TO OWN IN YOUR AREA. 20% RESTOCKING FEE APPLIES TO ALL NEW FIREARMS RETURNED. QUESTIONS? FEEL FREE TO EMAIL OUR SUPPORT STAF AND WE WILL RESPOND IN A TIMELY MANNOR. THANK YOU FOR VISITING BRYANT RIDGE TRADING AND PLEASE REMEMBER US FOR ALL YOUR FIREARM NEEDS!